"A delicious and easy method to cook mutton chops, spicy yet with the rich flavour of honey. Can be served with fried noodles or fried rice." In a shallow baking dish or resealable bag, mix together the honey, soy sauce, and hoisin sauce. Place the lamb chop into the mixture; cover and refrigerate for 3 hours. Heat the olive oil in a shallow wok over medium-high heat. Add the anise seed, garlic, onions and green chilies, and saute until the onion is tender, about 5 minutes. Place the lamb chops and marinade into the pan, and stir. Turn heat down to medium-low, and cover. Cook for 20 minutes, then remove lid, and continue cooking until liquid has evaporated. Stir in green onions, and cook, stirring, until the internal temperature of the meat has reached 145 degrees F (63 degrees C). 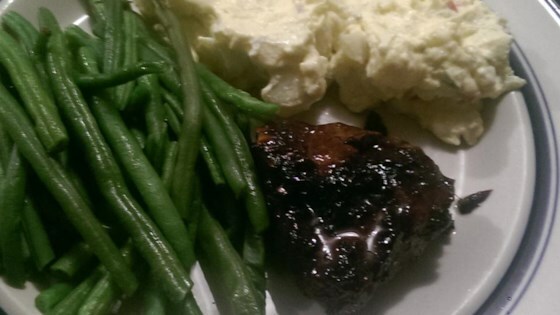 My husband raved over this and said it was the best way I had ever cooked it. Made this many times. Love it. Used the marinade for baked pork chops a few times too. Just fabulous.